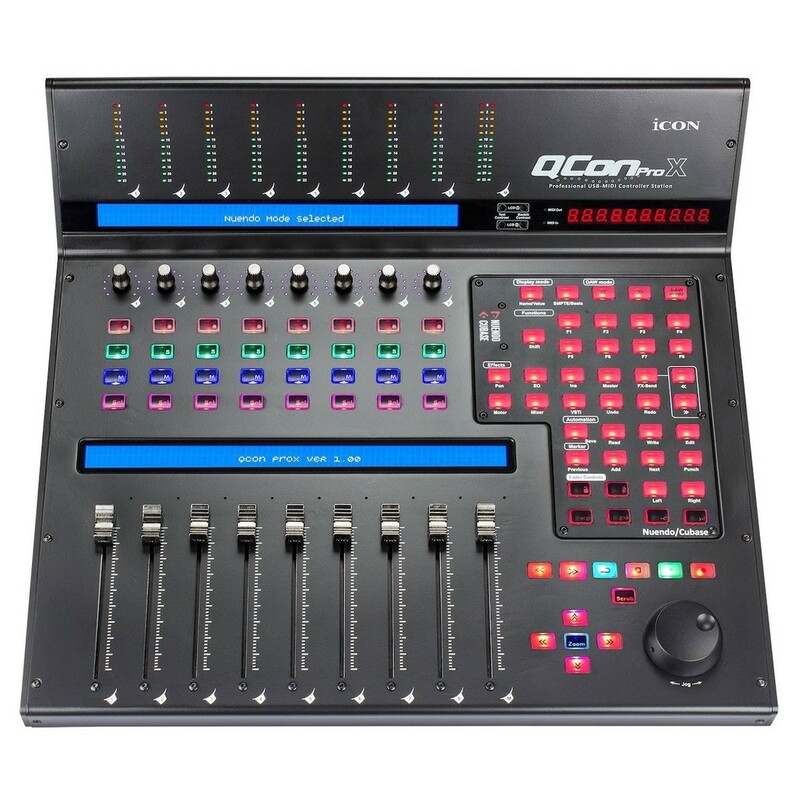 The Icon QCon Pro X is a highly-versatile DAW controller featuring 8 touch-sensitive motorized faders, a dual-backlit LCD screen and 8 dual-function encoder knobs. The Icon QCon Pro X is the perfect tool for controlling all your DAW parameters in one place, giving you a hands on approach to navigating your favourite music software. The QCon Pro X features both USB and MIDI connections for added convenience as well as a 12-segment LED meter bridge for precision visual monitoring. 18 assignable buttons are also included for added control, allowing you to assign the buttons to your favourite functions and parameters within your DAW. Each of the 8 channels features Record enable, Solo, Mute and more transport function for enhanced control. The Icon QCon Pro X features a wide array of assignable controls and useful buttons for controlling your DAW. 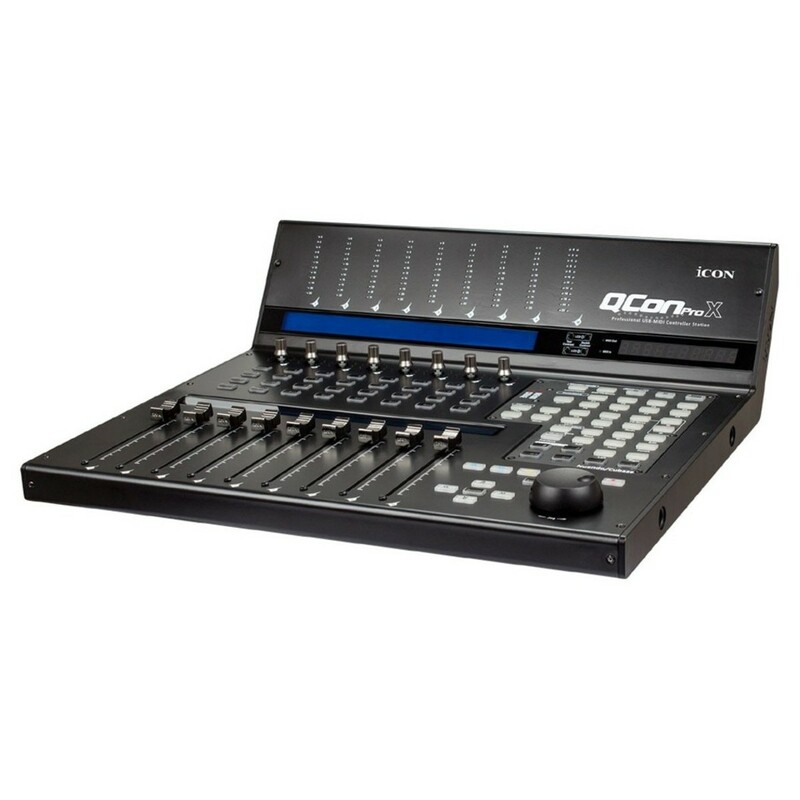 9 touch-sensitive motorized faders with 10-bit resolution are included for precision control for your volumes and other parameters. These touch-sensitive faders allow you to make precise changes to your audio, reacting to the slightest touch. 8 encoders are also included for rotary control, ideal for panning, volume levels and more. A jog wheel helps to navigate through your DAW, perfect for scrolling through sounds, presets and more. In addition, 18 assignable buttons are included, allowing you to control your most vital parameters that may not already be covered by the other controls. Transport buttons such as Record enable, Rewind, Fast Forward, Loop, Play, Stop and more help you to easily navigate through productions and recording projects. This wide range of versatile controls helps to minimise the amount of time spent in front of a computer and mouse, giving you a natural hands-on feel when it comes to recording and mixing. The 12-segment LED display is designed to show the time location of your project in either the SMPTE or BBT format, allowing you to keep track of audio length and other project information. The dual 2x56 backlit LCD displays give you other vital information such as channel name, control values and more for each channel. An illuminated zoom button features 4 direction keys allowing you to zoom in on audio tracks for a better look at your waveforms, allowing you to make subtle changes without having to revert using a mouse. A stereo LED master channel level meter is also featured on the metering bridge, display precise information on your overall levels and stereo field. This wide array of monitoring components gives you everything you need to monitor every aspect of your DAW project. The Icon QCon Pro X is unique in the way that is offers a range of DAW specific custom modules. These custom modules are template covers for the control surface that are configured for the controls of your favourite DAW. The Icon QCon Pro X features flexible integration for most major DAWs including Cubase, Nuendo, Ableton Live, ProTools, Logic, Reason, Studio One, Samplitude and Reaper. Once QCon Pro X is linked to your DAW it will always boot up in the correct configuration, even after being powered off for added convenience. Even if your selected DAW isn’t supported by the custom modules, you can manually map the function using the intuitive MIDI learn mode. The control surface itself is class compliant with most major operating systems for Windows and Mac and features a high-speed USB 2.0 connection for optimal performance value. 2 x 1/4'' connectors are included for connecting foot switches and expression pedals for added control. To get you started straight out of the box, Icon have included ICON edition Cubase LE and Samplitude LE. Additionally, ICON ''Quick-Setup'' driver is available for Cuase, Nuendo, Reason and Bitwig for instant plug & play compatibility.